Cultuurpark Westergasfabriek is one of Gustafson Porter + Bowman’s defining projects, and is considered as a model of brownfield reclamation within a physically dense urban context and a complex set of stakeholders. The scheme establishes a delicate balance between contamination and accessibility, invention and interpretation, restoration (of contaminated land) and revelation (of the potential of a post-productive site). Today it is a vibrant cultural center for the arts and a meeting place for surrounding communities. The masterplan (and subsequent detailed design) for the 11.5-hectare site creates diverse spatial and temporal experiences anchored by an axial promenade that transitions from a formal urban plaza in the east, to an open and naturalized framework to the west. It includes trails and gardens, an events field for 10,000 people, a playground, a waterfall, a bridge, and an artificial lake that can be drained to accommodate large festivals. The design also took into account the pedestrian experience, bicycle trails, and the vehicular needs of the many arts organizations located in the historic buildings. The existing grounds were reverted to a green, recreational park. Local residents were envisaged as the main users, and natural environmental qualities had to be strengthened. A one hectare open-air events area was added. 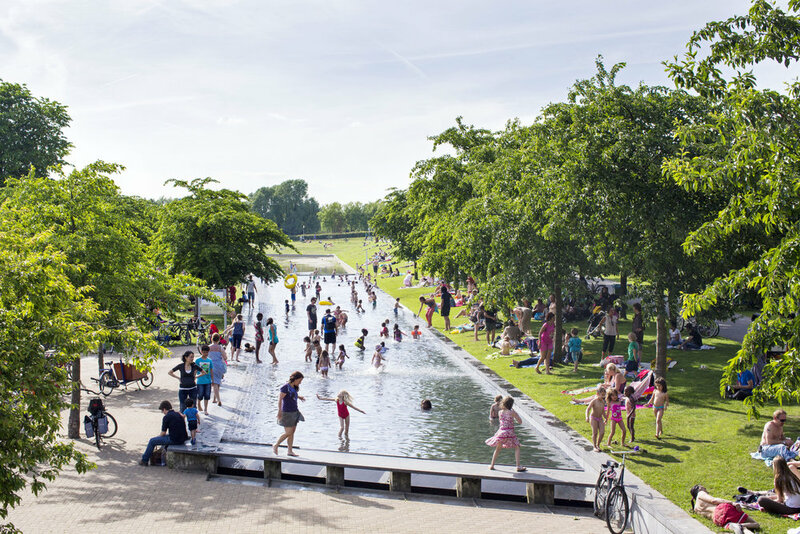 We were able to draw on experience of landforms, hydrology, and horticulture to address these complex challenges while focusing on the need for a wide range of cultural, recreational, and ecological programming of the new park. In its attentiveness to external circumstances, the design coalesces uses – civic, social, commercial, cultural, recreational, ecological – serving as a synecdoche for the city rather than the sequential circuit or continuous fabric of a conventional park. The success of the project can be attributed to an effective design process which incorporated public input and site-specificity from its beginnings. The process of design included a full year of well-organized public consultation process and also incorporated the transformation of industrial areas to the south of the site into a mixed use housing development.